Florida's Democratic nominee for governor says the state is looking for a leader who will bring people together, "not misogynist, not racist, not bigots." Tallahassee Andrew Gillum, who would be Florida's first black governor, told CNN Wednesday that he wants to "build a Florida that makes room for all of us and not just some of us." Gillum responded to DeSantis's statement on Fox news saying, "I think he's got another thing coming to him if he thinks that in today's day and age Florida voters are going to respond to that level of division." 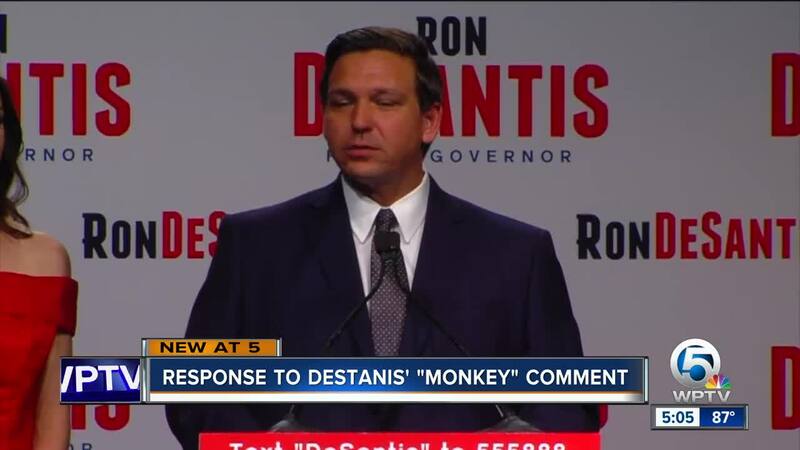 A spokesperson for the Florida Democratic Party, Caroline Rowland, said the comment was an indication of how DeSantis plans to run his campaign. "I don't think there's any question that it is divisive rhetoric," said Rowland. "You know, it's disgusting to us that he chose to use the word 'monkey' to describe the first African-American nominee for governor." Palm Beach County Republican Party Chair Michael Barnett agreed the word was inappropriate but believes it was not meant the way Democrats say it was. "Absolutely it was a poor choice of words. I wouldn't have used that choice of words; I would have said messed up or fouled up, but it was certainly not meant racist, If that's what the Democrats are going to try to do make this campaign into a race issue, they're going to get blown away in November," said Barnett. Gillum referred to DeSantis's comments as taking a page out of the campaign manual of President Trump. President Donald Trump, on Twitter, criticized Gillum as a "failed socialist mayor" and praised Republican Rep. Ron DeSantis, who credits the president for helping him win. Gillum said, "DeSantis can do the bidding of big business and big lobbyists and Donald Trump and his divisive rhetoric. I'm going to be here to do the business of the people of the state of Florida."